There currently appears to be a thriving rock and prog scene emerging around Bergen in Norway with bands like Seven Impale, Tiebreaker, D’accorD and Ossicles. Into this mix, we can now add Shaman Elephant, a four piece that has been drawing big crowds in their hometown. The band’s sound is described as being firmly grounded in the ’60s and early ’70s psychedelic and progressive rock style but mixed with modern touches. In 2015 they released their digital EP More, after which they were snapped up by Karisma Records. They then entered Solslottet studio in the spring of 2016 with producer Iver Sandoy, who has previously worked with Enslaved, Krakow and Seven Impale. There must be something in the air in Norway, to me it seems that the music there continues to push boundaries, it is not scared to try something different rather than churn out the same popular formulas. 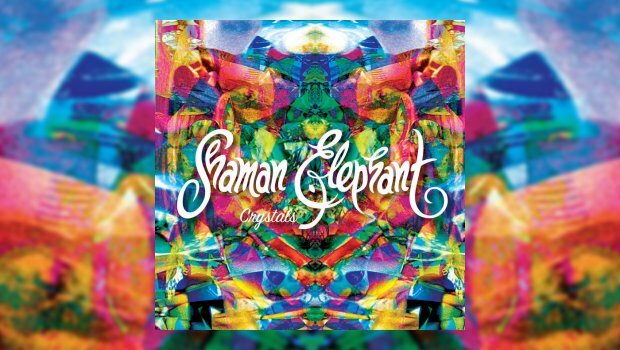 Shaman Elephant have taken their influences and crafted something that is different and has a modern sound, Crystals is an album that fans with their hearts in the seventies will love. Having said that they have not just rehashed the past but have created something fresh in an album of great variation, using the more progressive and psychedelic influences with some thunderous riffs thrown in for good measure. The core of the sound is provided by drummer Jard Hole and bassist Ole-Andreas Sæbø Jensen, who together create a great groove, delicate at times, powerful at others, driving the songs along. This provides a solid platform for the keyboards of Jonas Særsten and the guitar and vocals of Eirik Sejersted Vognstølen to shine through. The opening title track starts with guitar, quickly joined by a great groove from the rhythm section; the song twists and turns with a bright psychedelic feel cut with some heavier moments, at six minutes the guitar goes into a blistering solo and the band make a dash to the conclusion. A song full of melody which always stays just the right side of chaos throughout its eight-minute running time. The band cite their influences as The Mahavishnu Orchestra, Steely Dan and Jimi Hendrix, to name just a few, although I feel that there’s a sixties Zappa feel to Shaman in the Woods, and The Jazz begins with an almost Sabbath like riff, slow and heavy when at two minutes in the guitar changes the focus, becoming brighter and lighter as the song picks up pace with a sixties/seventies feel, ending with some grinding rock. So despite the title, not jazz at all, but that isn’t the case on the jazzy instrumental Tusco. Here we get a piano introduction before the bass joins in followed by drums, settling into a slow jazz groove which gradually picks up the pace throughout the song, propelled by the rhythm section which allows the piano to shine. Another example of this band’s diverse abilities. The album ends with the twelve minute Stoned Conceptions. From an almost gentle or mellow start the song grows and develops, almost unravelling but just holding onto the melody, some well-delivered vocals giving an almost pained feel to the lyrics. After eight minutes in we get some great organ work that builds towards another blistering guitar solo, the band then collectively pushing to the end in grandiose style. Shaman Elephant have created a very fine debut, full of excellent songwriting and performances. They have managed to provide light and shade to their music, not afraid to rock when needed, all the time with a fresh and modern sound. Repeated plays reveal more layers to the songs and the individual contributions from each member to the overall sound. For me an excellent discovery and I look forward to what they do next.